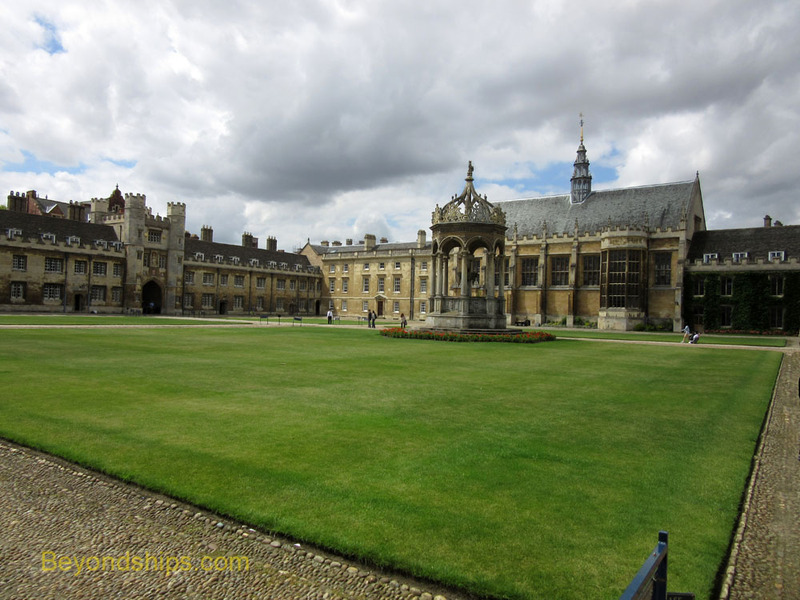 Trinity College is the largest of Cambridge's colleges and one of the richest. Sir Issac Newton belonged to Trinity as did Lord Byron who reportedly kept a bear in his rooms. More recently, Prince Charles studied here. 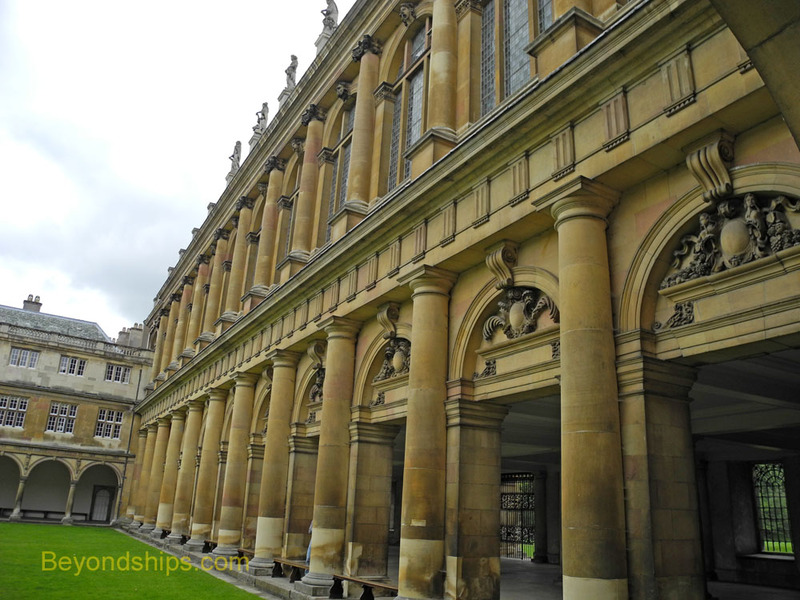 The college was founded by King Henry VIII in 1546 by amalgamating two existing colleges. As a result, some of college's buildings pre-date Henry's reign. Visitors enter Trinity through the Great Gate . Above the arch is a large statue of Henry VIII. It was designed to convey the king's majesty by depicting him holding the orb and scepter, symbols of his regal authority. 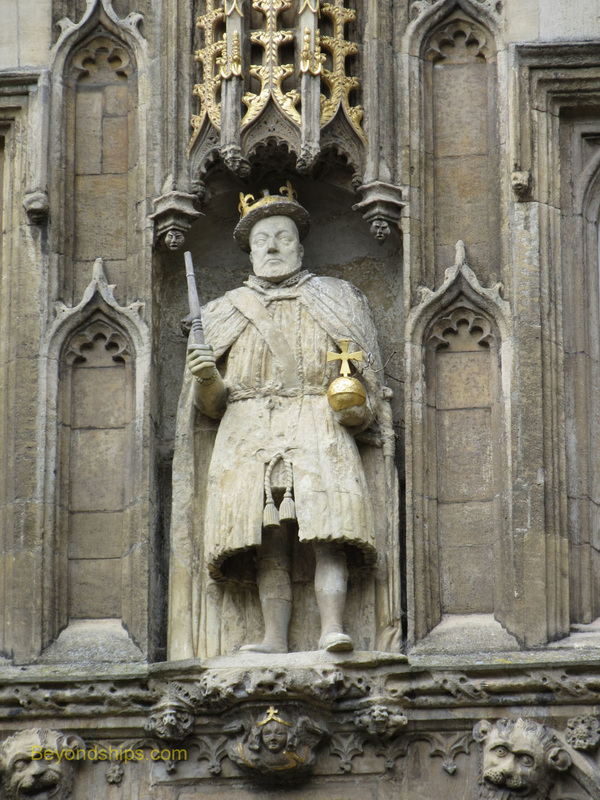 However, as a result of a student prank, Henry just looks ridiculous as he is holding a chair leg in the hand that is supposed to have the scepter. It has been that way for many years and has become a landmark. Perhaps it can be seen as a tribute to Cambridge student pranks, some of which have been quite inventive. According to legend, two undergraduates succeeded in convincing the authorities that they were kings of Africa and received an elaborate welcome and guided tour of the university. In another famous episode, a car was suspended underneath one of the bridges over the Cam. Along the same lines, another motor vehicle was found on the roof of the Senate House. Going through the Great Gate, you come to the Great Court. 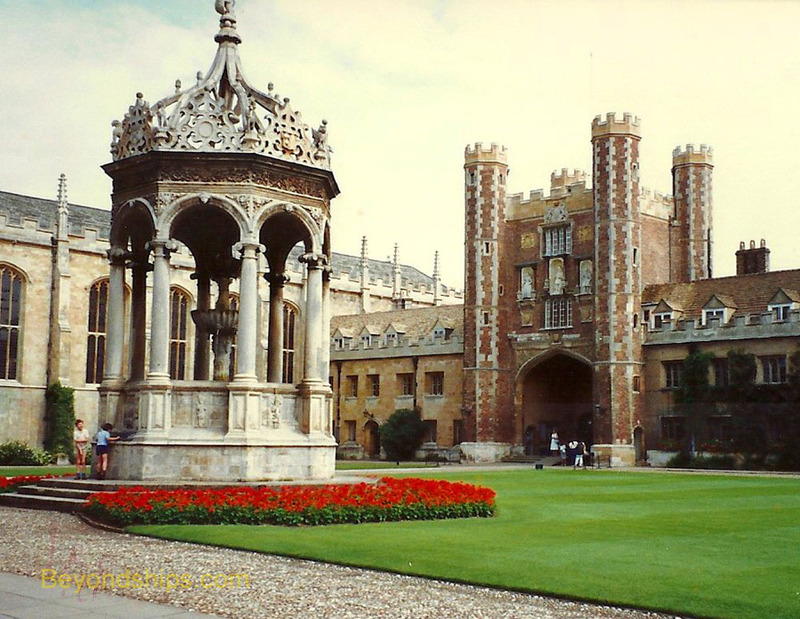 It is the largest of the Cambridge courts and was created in the 17th century. In the middle of the court is a fountain dating from 1601 (rebuilt in 1715) where it is said students used to do their washing. Around the perimeter of the court are the chapel, the clock tower, the hall, and the master's lodge. In recent years, the court achieved fame as the site of the Great Court Run depicted in the popular film “Chariots of Fire.” This contest requires a student to run around the courtyard in the time that it takes the clock to strike noon. Contrary to the movie, Harold Abramham, who was an undergraduate at Gonville and Caius College, never attempted the Run. The first person to actually accomplish this feat was Lord David Burghley in 1927, the person who Lord Lindsay in the film is modeled after. 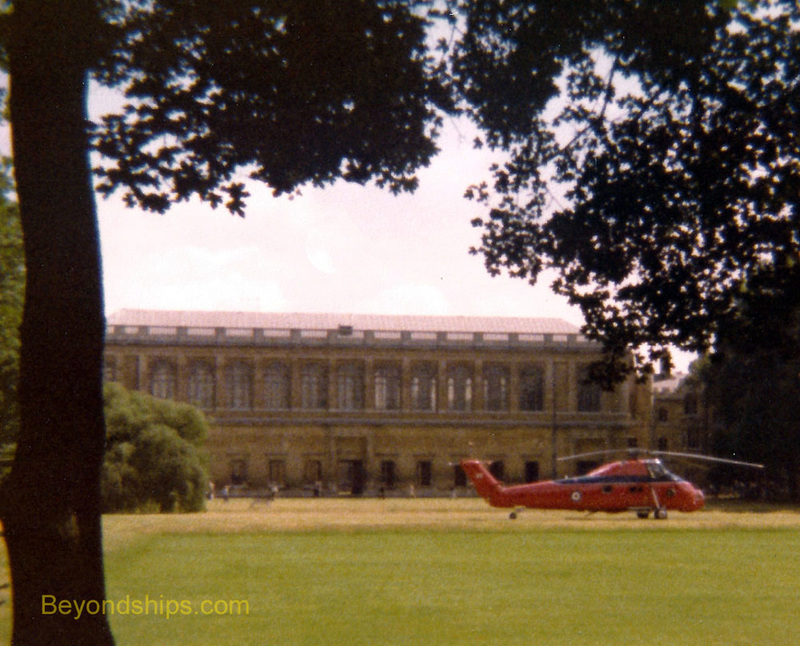 Interestingly, although much of the film is set in Cambridge, it was filmed at Eton College near Windsor, as the film company was reportedly refused permission to film at Cambridge. Above: The Wren Library from Neville Court. Below: The Library from the River Cam. 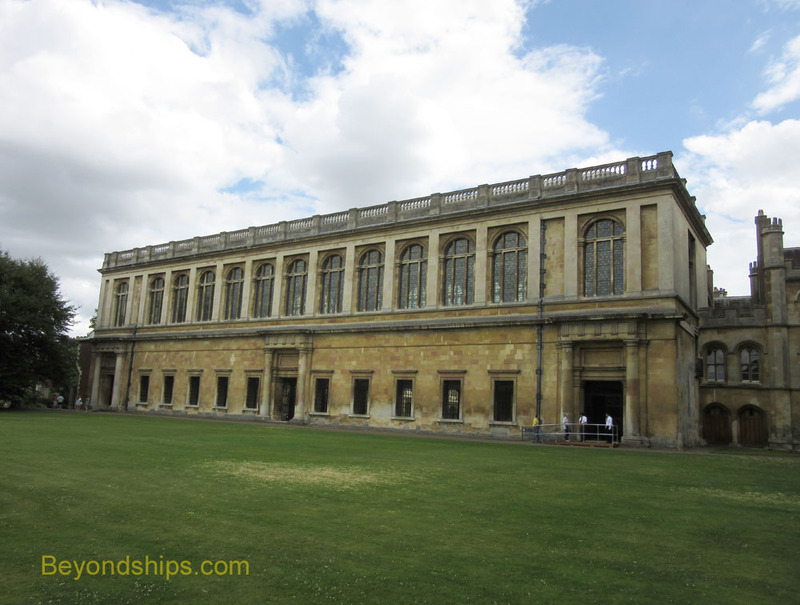 On the west side of Neville Court is one of the architectural gems of Cambridge - - the Wren Library. In the late 1600s, the master of Trinity, Issac Barrow, asked his friend Christopher Wren, the architect of St. Paul's Cathedral in London, to design a library for Trinity. Wren not only agreed but donated his services for free. The building is exquisite example of classical proportion. The ground level is a series of arches that hold the library aloft. 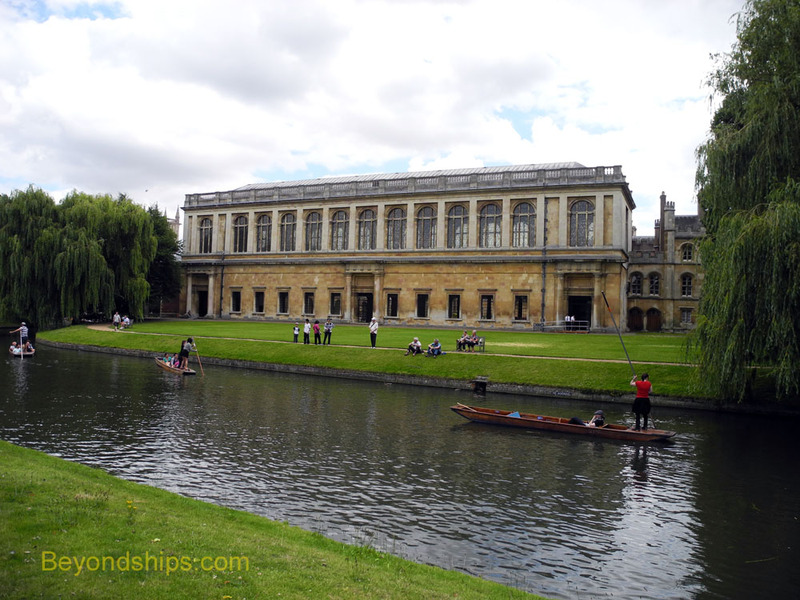 (Wren was concerned that the nearby River Cam might flood and damage the books if the library were at ground level). The next story continues the pattern of the colonnade but the arches surround large windows, which allow natural light into the library. Wren did not just design the building but also the furniture within. In addition, there is wooden carvings by the master Grinling Gibbons. There is also a full size marble statue of Lord Byron that was originally intended for Westminster Abbey but which was rejected because of the poet's scandalous lifestyle. The library holds many rare books and manuscripts. These include more than 1,200 medieval manuscripts, autograph poems by John Milton, Sir Issac Newton's notebook, A.A. Milne's handwritten manuscripts of Winnie the Pooh and The House at Pooh Corner as well as various collections of rare printed books. The Wren Library is only open to visitors a few hours Monday through Saturday. Visitors are limited to 15 at a time. Consequently, lines to get in are not uncommon.